In fairness to everybody here, I'm just going to end on one note. And that is that we continue to poll on who's best equipped to be Commander in Chief, and John McCain continues to lead in that category despite the criticism from Barack Obama by a factor of 53 to 42 percent in our latest NBC News/Wall Street Journal poll. Gentlemen, thank you very much. We checked, and the latest NBC poll actually has no question about Commander in Chief. We contacted NBC about this, and it turns out Brokaw was referring to a poll taken weeks ago--right after the Republican convention and well before Friday's big national security debate. And in each of NBC's last two polls, Americans chose Obama over McCain. 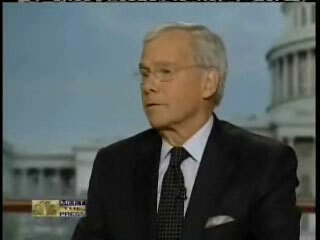 Can you email Tom Brokaw today? Let him know that this election is very close, and we need journalists to be responsible. Giving himself the last word in the debate, and citing an outdated poll number as if it was current, was a mistake. As a responsible journalist, he should apologize for both. On a related note, a journalist from a well-reputed publication also saw my post and asked NBC to explain where Brokaw got his facts. At this time, they've yet to respond. Interesting that they responded to MoveOn so much more quickly than one of their own, isn't it? 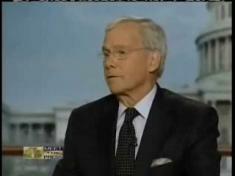 Brokaw tells Steinberg he "advocated" for a modification to the anchor duties of MSNBC hosts Keith Olbermann and Chris Matthews during election nights. His reasoning came with praise for the Countdown host. "Keith is an articulate guy who writes well and doesn't make his arguments in a 'So's your old mother' kind of way," he said. "The mistake was to think he could fill both roles. The other mistake was to think he wouldn't be tempted to use the anchor position to engage in commentary. That's who he is."